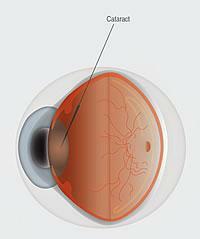 Cataracts are a normal part of the aging process. A cataract is a gradual clouding of the lens inside your eye, a gradual clouding that can make your vision less sharp over time. A cataract can progress until eventually there is complete loss of vision in your eye – and neither diet, drops, or changing glasses will make the cataract go away.